Penny Arcade and Minecraft are teaming up to make a new game that seeks to reinvent the classic collectible card game genre. 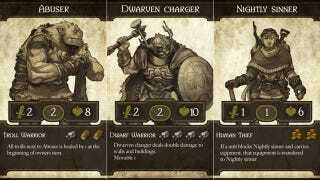 Scrolls will be developed by indie game studio Mojang and feature writing by Penny Arcade's Jerry "Tycho" Holkins. "Notch and I started discussing the idea of Scrolls nearly five years ago," said lead designer Jakob Porser. "We are both great fans of the CCG genre, but we felt that there were some common gameplay flaws in the available titles. We're excited to finally put all our thoughts into action with the realization of Scrolls." Holkins brings his flair for writing and deft use of adjectives to the game's back story. Holkins says he and the rest of the folks at Penny Arcade are big fans of Minecraft. "Ever since Minecraft took root in the offices, it's transformed once vital staffers into shambling hulks, concerned only with the construction of monolithic structures," said Holkins. "When Notch said the Mojang guys had an idea for another game, I decided it would probably be safest just to join them." Still in beta, computer game Minecraft already has more than 4.5 million registered users and has sold more than 1.4 million copies. The game was developed by Markus "Notch" Persson. Persson has since formed Mojang, a studio of nine based in Stockholm, Sweden. Scrolls, Mojang's first game as a team, will combine elements from classic collectible card games with tabletop and board games, according to a Mojang press release. "Scrolls features the fun of collectible card games with the strategy element of board games, as players' placement of units, buildings and siege weapons on a game board are vital to victory," according to a press release. "Scrolls also offer a strong meta game strategy aspect, as players will assemble their collection of scrolls prior to entering battle mode. Spells, units, equipment and resources must be managed just right to be successful." The game, which will be available on Scrolls.com later this year, will support both single match play as well as global tournaments.